​Kaitie has been honing her musical talents since the age of 8. Before she even picked up her first instrument, she was soaking in the music industry from regularly attending her father’s blues and rock gigs. In 1996 she stepped on to her first stage and has been performing ever since. Sly has worked as a session bassist, teacher, and performer in Canada, the US, and the UK. She attended the renowned Musicians Institute in California to study under the likes of some of LA's top session musicians. There, Kaitie received an Associates Degree in Bass Performance as well as the Outstanding Student Award upon graduating from her program. 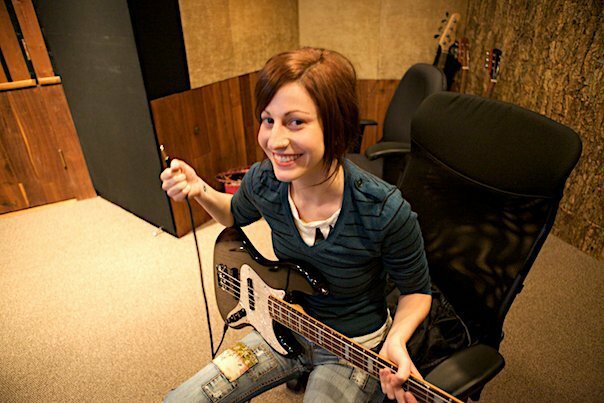 During her time in LA, she worked as a session bassist, backing up artists, playing on award winning albums, and collaborated with television composers. Kaitie is the owner and creator of a music school and media production company where she has been an avid bass teacher for several years. She also writes music for media, and works with a music licensing company in Los Angeles. Her music has been featured in many videos for Canadian corporations, post secondary institutions, and the Province of British Columbia. Kaitie has been featured on the player spotlight of www.notreble.com and has collaborated and played for countless artists both in Canada and the US. In addition to bass playing, teaching, production and running her own business, Kaitie currently writes and performs as a vocalist and bassist with her solo project, and collaborates with guiarist/composer, Sandesh Nagaraj, in their project titled "Syreim." Level 1: Published January 10th, 2016. Level 2: Published January 10th, 2016. Level 3: Published August 8th, 2016. Level 4: Published August 10th, 2016. Level 5: Published August 22nd, 2016. Level 6: Published August 22nd, 2016. Compendium of Levels 4, 5 & 6: Published September 5th, 2016. Bass Curriculum for the US Music Lessons franchise. (Custom Designed, Commissioned Curriculum) Published: December 2015.